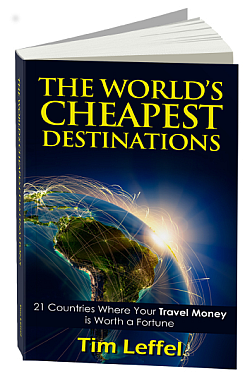 The World’s Cheapest Destinations Book – Now in its 4th Edition. As seen in the Wall Street Journal, Travel & Leisure, Men’s Health, Newsweek, USA Today, Maxim, Real Simple, L.A. Times, Fortune, Smart Money, MSN.com, Women’s Health, National Geographic Traveler, Budget Travel, Frommers.com, Miami Herald, the Guardian, and more! Travel doesn’t have to be expensive and if you visit the cheapest places to travel, it can cost you far less than what you’re spending just hanging out at home paying bills. You can see the world on $25-$50 a day after airfare by picking the right destinations. In these places you’ll find that $2 meals, $1 museum admissions, and $10 private rooms are the budget travel norm, not the exception. Whether you’re on a bare-bones budget or are a mid-range traveler just trying to get a lot more for what you want to spend, this book gives you the lowdown on how to travel well for less. Whether you’re looking to take a year-long trip around the world, go on a sabattical for a few months, or find the cheapest deals for last minute vacations, this book will help you find the best travel values around the world. The World’s Cheapest Destinations is available through virtual or real bookstores or order direct from the author or publisher. Paperback $15.95, e-book or Kindle version $8.99. Get the book!